Alves Uvenim, a Dunmer alchemist, is Journeyman of the Mages Guild who sells alchemical supplies and spells at the Leyawiin Guild Hall. During the Whom Gods Annoy quest, she will tell you what to do to get rid of the Staff of the Everscamp. She has a very laid-back lifestyle: she sleeps from midnight until 7am in her room in the ground floor of the guild building. For the next three hours, she will wander around the ground floor before starting to mix up potions with her mortar & pestle. She will stop at 4pm, when she will select an alchemical book and read it for four hours seated by the desk in the eastern wing of the ground floor. Between 8pm and 10pm she will eat dinner in the ground floor dining room with her fellow guild members. She will then spend the last two hours of her day wandering around sleepily. She has 800 gold and a Mercantile skill of 40. She will buy ingredients, potions, alchemical apparatus, and miscellaneous items from you. She will offer both her spell merchant and her bartering services at all times except when eating, sleeping, or when wandering in the evening. She wears middle-class attire consisting of a blue & green outfit and a pair of quilted shoes. She also carries her mortar & pestle, an empty grand soul gem, and a leveled amount of gold. She doesn't wield any weapons, relying instead on a set of lower-level spells from all of the magical schools but Illusion. The first time you meet, she greets you by saying: "Alves Uvenim, Journeyman of the Guild. Welcome to Leyawiin. I don't believe we've been introduced." If you are not yet a member of the Mages Guild, she will encourage you to join as soon as possible: "The guild offers magical supplies to the citizens of Tamriel, but has far greater benefits for its members. Talk to Dagail if you'd like to join." When asked about the city of Leyawiin she will have the following observations on the internal problems of the guildhall: "The Leyawiin chapter is just drifting along. Dagail isn't much of a mentor or leader. She isn't even coherent most of the time." If you ask her about a recommendation she will point you to Dagail: "You'll have to speak to Dagail about that." 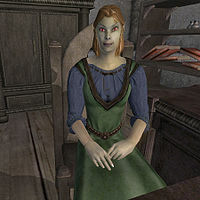 When asked about the Guild itself, she will direct you all the way to Druja in Skingrad: "Druja has a wide variety of spells for sale, if there's something you need. Most of them are simple, but they're a good starting point." During the Recommendation quest, when asked about Agata, she'll respond: "Agata is the first person I go to when I need something. Maybe I should talk to Dagail instead, but I just don't feel comfortable doing that." Then, when asked about Dagail, she'll say: "She was a very powerful mage once, from what I understand. Hard to imagine that, honestly." When asked about the Seer's Stone, she will hint at Kalthar with the words: "All I heard was that it was important to Dagail, and it was missing. Kalthar didn't tell me anything more than that." The only rumors about Alves come from her friend, Rosentia Gallenus, as she tried to engage your help with her problem. She tells you that "I need you to get over to the Mages Guild and talk to a good friend of mine, Alvis [sic] Uvenim. She's the only one in town that I trust. ", that "Alves is a practiced researcher... she's sure to have some good information for you." and that "Alves should be able to help rid me of this staff. We play cards at the Three Sisters often and are old friends. Seek her advice!" Rosentia is right about Alves being a practiced researcher; when you approach her she will immediately say: "Poor Rosentia, she's been trapped in her house for days." When you ask her how she guessed your errand she will say: "Frankly, the smell gave you away. You must have stepped in... well, let's just say something that isn't pleasant. Just be sure and keep this quiet. If the other mages even knew that I was involved with Rosentia's new guests... I could get kicked out of the guild!" When you ask her about the Staff of the Everscamp she will tell you about her research: "Doing a bit of digging, I'm afraid Rosentia's been stuck with the Staff of the Everscamp. Nasty bit of 'fun' by Sheogorath, I'd say. The only way she can be rid of it is if someone willingly accepts it. It can't be discarded in any other manner. No one would buy that thing once it's activated like it's been. The only chance is to return it to its original resting place, Darkfathom Cave. Inside the cave, there's rumored to be a shrine to Sheogorath. That's where the staff can finally be dropped and the scamps should remain behind. I also learned that the staff makes the owner move much slower than normal. I suppose it's another way the creator upped the annoyance factor. Please, bring Rosentia this information at once. And if you can, help her. I think she's about to crack under the pressure, poor thing." After marking the location of Darkfathom Cave to your map she will add: "Oh, yes. Don't bother trying to kill one of them. As soon as you do, another will take its place. It's endless. Quite the curse, eh? Sheogorath certainly has a sick sense of humor." If you pay her a visit accompanied by the scamps she will tell you a bit more: "The Everscamp is unique. Not quite as powerful as a regular scamp, it can barely use magic and is more of an annoyance than a threat." She will finish the conversation with: "Please, get those things out of here." If you return to speak with her after having relieved Rosentia of the staff she will sarcastically comment: "You've returned. And with the little ones in tow. Lovely." She also knows the location of Nocturnal's Shrine. Once you have read Modern Heretics or spoken with Ulene Hlervu about "Cheydinhal", a new "Daedra shrines" conversation topic will appear. When you speak to Alves about this, she will mark the shrine on your map with the words: "You mean the shrine to Nocturnal? That's north of Leyawiin, east of the Lower Niben." Alves is one of the few alchemists who will not point you towards Sinderion when you show her a sample of nirnroot.